School holiday is happening on this Saturday for a week from this 26th August 2017 till 3rd September 2017. For those who yet to plan for holiday or activities with your kids, do consider bringing them to Sunway Putra Mall for an adventures with Thomas & Friends. 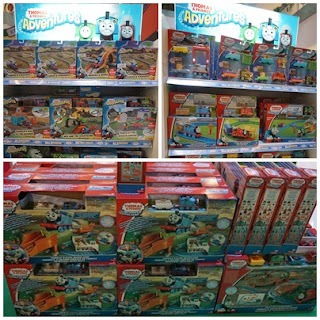 Mattel Southeast Asia (Mattel) has collaborated with Sunway Putra Mall to bring exciting activities around Thomas' new Adventures beyond the Island of Sodor. Basically you could spot Thomas & Friends in the locations such as Tidmouth Sheds, Knapford Station, Brendam Docks and Sodor Steamworks. Thomas which is everyone's favourite little blue engine will begin its journey to lands beyond the Island of Sodor into the sea and out in space. Check out the instructions as above. Your child must be age 3-12 years old with a minimum of 80cm and maximum of 150cm. Once qualified with the requirements, then your child could climb up and slide into the sea but they must beware of the shark. After that jump and reach for the stars and planet. Once completed the challenge, your child could proceed to the reward counter to redeem for a FREE train ride or purchase a minimum of RM120 and above on Thomas & Friends merchandise to redeem an exclusive session. The exciting adventures is also represented in the latest toy line which is now available for sale at major retailers, departmental stores and hypermarkets. From now till 3rd September 2017, the Thomas & Friends Adventures will be held at the Main Concourse of Sunway Putra Mall. Our children will get to experience the Adventures on land, sea and space with their favourite blue engine. Visitors stands a chance to bring home a limited edition Super Station sets when you spend a minimum of RM120 in a single receipt at the toy corner by Toys "R" Us. For more information, do visit their official facebook page at www.facebook.com/sea.thomasandfriends. Besides for the Thomas & Friends activities, we could bring our kids for a day out at the newly opened Fun Scape by Cobay, an entertainment park located at Level 4 or the 1st Indoor London Theme Park Playland at the Parenthood. Do check out the free candy floss and pretty Clown Cher Cher who gave free balloon sculptures for all the kids. Thanks for the sword and the creative arrow that made from balloon. For those who are going to Sunway Putra Mall, do enjoy the RM5 off a ride to/from Sunway Putra Mall by entering the PUTRASALE17 promo code. You could visit www.grb.to/putrasale17 to check the terms and conditions. For more information, do visit their website at www.sunwayputramall.com and do like them at their facebook page at www.facebook.com/sunwayputramall for the latest updates. Remember to bring your children over to Sunway Putra Mall to enjoy all the activities for free. Most of their outlets are having promotions now with discounts up to 70%. The newly opened XES outlet at Sunway Putra Mall are having promotions for BUY 1 GET 1 FREE for all their shoes on that weekend. Daddy bought his working shoes and Mommy Jane got my casual shoes for FREE. Yeah... Daddy also bought some printing inks and files from Popular Book Store. With accumulated 1 or 2 receipts at RM150, we able to redeem 2 FREE TGV movie tickets. A win win situation for all of us at Sunway Putra Mall. It is indeed a family friendly mall that Mommy Jane always bring Little Angels here to have fun, dine-in, shopping and watching movie together. Maha, sure anak sedara u gembira coz' kanak-kanak pasti suka bermain. woww!! so cute, yeay can ride the train. boleh bawa adik-adik ke sini nanti. Bro, bring them here. Lots of free activities that your children will enjoy. Untungnya anak you Jane. Mcm2 permainan mereka dah cuba..sure mereke seronok kan..
Lihat anak2 happy kita pun turut happy ya tak? Kak, betul betul. As long as they feel happy, all the sacrifice is really worth it. wowww thomas & friends!... so interesting.. my kids sure gonna like this..
Mrs Puex, indeed interesting especially during school holiday. Rawlins, I'm sure they are. Running here and there and build up their imaginations.